In a recent Edmodo poll I conducted with students at my school during orientation week, historical fiction came in DEAD LAST for preferred fiction reading genres. In order of favorite to least favorite, the rankings were: adventure/suspense, horror, dystopian, sports, romance, fantasy/sci-fi, paranormal, urban lit, and at the very bottom of the genre totem pole…historical fiction. I’ve found students who love historical fiction really love it – almost to the point of refusing to read other genres – but for the most part, I get blank, disinterested stares when I try to recommend books about past events or people. That said, the one sad era in history that never ceases to peak student interest is the Holocaust. There’s something about World War II and the Holocaust, in particular, that to this day draws in readers who otherwise want nothing to do with historical fiction – maybe it’s that the Holocaust, where one group of people did their best to completely annihilate another group of people, is at root both an adventure/suspense and horror story for the Jews who experienced it and those of us who read accounts of it today. 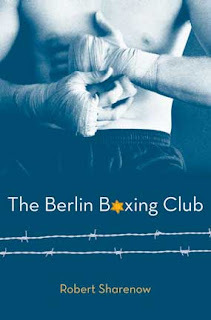 Part of what makes Robert Sharenow’s The Berlin Boxing Club stand out from other Holocaust titles is that Sharenow jumps in at the early part of Hitler’s rise to power, right as the Hitler Youth movement is taking root. Karl Stern is one of a handful of Jewish students at a Berlin prep school - but if you ask him, he’s a Jew by birth only. His family doesn’t actually practice Judaism as a religion or recognize any orthodox Jewish observances, and Karl himself could pass as part of the elite Aryan race Germany’s new leader Adolf Hitler is promoting – blonde, blue-eyed, light-skinned…the symbol of human perfection - unlike those dark, vile, rat blood-filled Jews. Unfortunately, Karl falls prey to some school bullies who suspect him of being a Jew. They beat him and then pants him to see if he’s circumcised, and once Karl’s secret is out, he’s got a target on his back. Humiliated, Karl lies to his family and claims to have ‘fallen down some stairs,’ an obvious lie that his family ignores since they’ve got problems of their own. His mom battles depression, while his dad, an art gallery owner, is steadily losing business since Hitler has banned all art by the Expressionist painters Karl’s dad supports, threatening to jail anyone who shows or sells those paintings. Instead, Karl’s father makes what little money he can printing up flyers for some underground (ie. homosexual) clubs in Germany. It’s at one of his dad’s last art gallery showings that Karl meets Max Schmeling, a champion boxer and national German hero. Every German boy dreams of having the strength, wealth and fame of Schmeling, who beat famed American boxer, Joe Louis, in their first face-off. A cartoonist in his spare time, Karl's never cared much about physical sports, but when Schmeling calls him out on his busted face, saying he knows Karl was on the losing end of a fight not a flight of steps, Karl is ready to do what it takes to learn to fight and protect himself. Remembering Karl’s dad has a painting that a German expressionist painter did of him, Schmeling bargains with Karl’s dad – the painting in exchange for training Karl for free at his gym, the Berlin Boxing Club. After some begging on Karl’s part, his dad relents and the deal is made. Karl takes his training seriously, getting up early each morning to do “the 300” – 100 push-ups, 100 sit-ups, 50 pull-ups, and 50 minutes of running. Sure enough, after months of training, he finds himself growing stronger, and when Max returns from a tour of the States, he gives Karl the green light to start his boxer training at the gym. Dedicated and determined, Karl impresses the seasoned boxers at the gym with his speed and quick cuts, and before long he’s winning some amateur matches. But while Karl is getting better in the gym each day, things are only getting worse for the Jews remaining in Germany. Many flee the country after their businesses and homes are vandalized, and some families and Jews in the community start to disappear, including Karl’s outspoken, anti-Fascist Uncle Jakob, who they later learn was taken to a concentration camp specifically for Jewish traitors. When Karl’s family is evicted from their home and forced to live in the cramped quarters of his dad’s gallery basement, the Sterns realize the Germany they once knew is never going to be the same. This book came highly recommended to me by no less than three students – all girls! – who read and loved it. The boxing storyline is secondary to the struggles of the Jewish Germans living in Nazi Germany, so while male readers might be drawn to it from both a sports as well as historical standpoint, don’t assume girls won’t like this one too. They do. I did. To learn more about Robert Sharenow and his book, in addition to the true story of Max Schmeling, you can visit his website at http://robertsharenow.com/ .